Thomas Jefferson, third U.S. President, was a man of great talent and convictions. He believed that all men should be free. He was shy and quiet in person, but he was a great writer. He was the primary writer of the Declaration of Independence and is often called, “The Father of the Declaration of Independence.” He also penned a document calling for the separation of church and state. 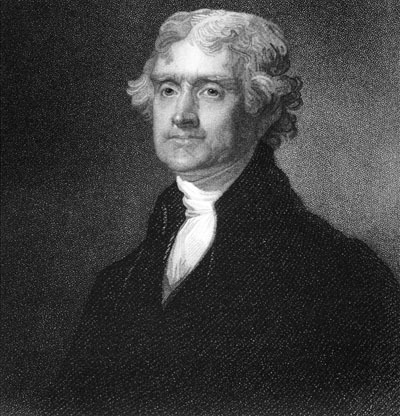 Thomas Jefferson served two terms as president. He was one of the original founders of the Democratic Party, which today bears little resemblance to his early ideals. He believed in limited Federal government and strong state governments; low (or no) taxes; and equality for all men. Thomas Jefferson was born April 13, 1743 in Albemarle County, VA. (previously Shadwell, Goochland). Jefferson’s father was a surveyor (measurer and mapper of land), government official and landowner. Jefferson’s father died when he was 14. Jefferson went to live with a tutor when he was 9-years-old. He attended the College of William and Mary in Williamsburg, Virginia. He had a classical education, studying science, philosophy, Latin, mathematics, English, law, literature, Greek and French. He became an attorney. Jefferson married Martha Wayles Skelton Jefferson. She died 10 years later. They had six children, four of whom died in childhood. He belonged to the Democratic-Republican party (later changed to Democratic). Thomas Jefferson disliked anything associated with wealthy British government. As President, he wore casual clothes and often answered the front door himself, welcoming guests into the White House. Thomas Jefferson gave full freedom of speech to the press. He ended U.S. taxes and decreased the national debt by one-third. Jefferson allowed no slaves to be imported into the country. One of Jefferson’s most important contributions to the country was the Louisiana Purchase. He bought 800,000 square miles of land from the French for $15 million. The territory ran from the Mississippi River to the Pacific Ocean and nearly doubled America’s size. Jefferson organized the Lewis and Clark expedition to explore this newly-purchased wilderness, preparing it for settlement. Like all Presidents, Thomas Jefferson was human and made mistakes. Although he disliked debt and spoke out against it, he died with huge debts. Jefferson disliked slavery, yet kept over 200 slaves. Jefferson died exactly 50 years after the approval of the Declaration of Independence, on July 4, 1826. He was 83 years old. Question: What were Thomas Jefferson’s hobbies? Answer: Jefferson loved learning and reading. He founded the University of Virginia. He spent years designing and building his home on a hill, Monticello. Jefferson was a naturalist too. He loved riding his horse around his estate. Declan, Tobin. " Thomas Jefferson Facts for Kids ." Easy Science for Kids, Apr 2019. Web. 20 Apr 2019. < https://easyscienceforkids.com/history-thomas-jefferson/ >.